KIEV, Ukraine, November 30, 2016 (ENS) – Thirty years after the nuclear disaster in Chernobyl, the radioactive remains of the power plant’s destroyed No.4 reactor have been safely enclosed following one of the world’s most ambitious engineering projects. A ceremony in Chernobyl Tuesday marked the successful conclusion of the sliding operation, a key milestone before the finalization of the international program to transform Chernobyl into an environmentally safe and secure state by November 2017. Chernobyl’s giant New Safe Confinement was moved over a distance of 327 metres (.2 miles) from its assembly point to its final resting place, completely enclosing a previous makeshift shelter that was hastily assembled immediately after the 1986 accident. The Chernobyl arch is the largest moveable land-based structure ever built, with a span of 257 metres, a length of 162 metres, a height of 108 metres and a total weight of 36,000 tonnes equipped. It will make the accident site safe. With a lifetime of 100 years it will allow for the eventual dismantling of the ageing makeshift shelter from 1986 and the management of the radioactive waste. The equipment in the New Safe Confinement will now be connected to the new technological building which will serve as a control room for future operations inside the arch. The New Safe Confinement will be completely sealed off from the environment. Finally, after intensive testing of all equipment, handover of the New Safe Confinement to the Chernobyl Nuclear Power Plant administration is expected in November 2017. The New Safe Confinement structure was built by Novarka, a consortium of the French construction firms VINCI Construction and Bouygues Construction. Works started in 2010. The Chernobyl disaster was a catastrophic nuclear accident that occurred on April 26, 1986 in the No.4 light water graphite moderated reactor at the Chernobyl Nuclear Power Plant near Pripyat, in what was then part of the Ukrainian Soviet Socialist Republic of the Soviet Union, USSR. During a hurried late night power-failure stress test, in which safety systems were deliberately turned off, a combination of inherent reactor design flaws, together with the reactor operators arranging the core in a manner contrary to the checklist for the stress test, resulted in uncontrolled reaction conditions that flashed water into steam generating a destructive steam explosion and a subsequent open-air graphite “fire”. This produced updrafts for nine days sending plumes of radioactive isotopes into the atmosphere. Nearly all of this material fell onto the western USSR and Europe. 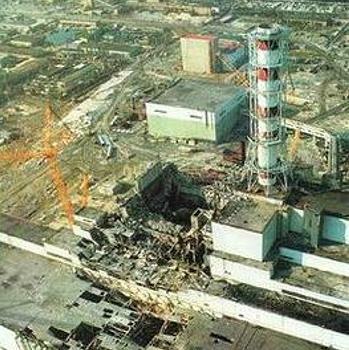 The Chernobyl disaster was the worst nuclear power plant accident in history in terms of cost and casualties. It is one of only two classified as a Level 7 event, the maximum classification, on the International Nuclear Event Scale. The other was the Fukushima Daiichi nuclear disaster in Japan in March 2011. Built at a cost of €1.5 billion (US$1.58 billion) the giant New Safe Confinement structure is the most prominent element of the Shelter Implementation Plan for Chernobyl, which involved more than 300 projects and activities. 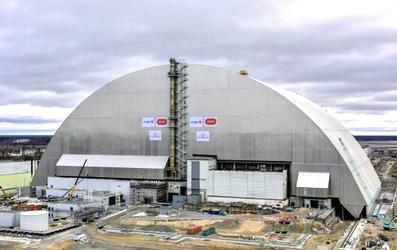 The €2.1 billion (US$2.22 billion) program is financed by the Chernobyl Shelter Fund. Established in 1997, the Fund has received more than €1.5 billion from 45 donors to date. The European Bank for Reconstruction and Development, EBRD, manages the Fund and is the largest contributor to the New Safe Confinement project. “The spirit of cooperation gives us confidence that the project will be completed on time and within budget a year from now,” Sir Suma said.